There’s something deeply satisfying about lifting up a full pint glass for that first foamy taste. I don’t know if it arcs back to our tree-dwelling ancestors embracing tools for the first time, but lifting that first pint flushes me with a sense of primitive strength, instantly making me feel wholesome, manly and satisfied. “I’ve bloody earned this…,” I think, regardless of whether I’ve just scaled a mountain or had a quick go on the washing up. I don’t think it’s that pints are particularly heavy but there is a certain weight attached to them; a gravity. I like to imagine that full pints actually defy a number of the accepted laws of physics, and that that if there was a bar on the moon, Armstrong and Aldrin would be busy floating around while the pint would sit sturdily on a beermat, giving a metaphorical middle finger to Newton and Einstein. Maybe it’s something to do with the way you bend your arm on that first lift. If you’re at the bar, you always have a small sip before you head table-wards. Don’t know why, but you do. Cheeky sip at the bar, nobody’ll know. Maybe you have a sip of someone else’s pint too. A ‘my round’ tax. Sustenance for the walk back to your stool. That sip at the bar always involves a jutted elbow, making the angle between bicep and forearm as acute as possible, before the robotic crane-like lift and delicate wrist-swivel to dispatch pint into mouth. And then the reverse action, usually accompanied by an ‘mmmmmmm… nice drop,’ or some vague and knowledge-less comment on the possible tastes and brewing methods; “It’s a hoopy one that pal, but I quite like it.” This comment will almost certainly be repeated when placing buttocks back on stool at the table, just to show that you’ve tasted it, and you know what this beer’s all about. Because you’re a bloody legend! And finally, the pint is returned to it’s resting place while you pay for the round. There’s two classic approaches to this – the slam (show of strength, sending out the message that ‘I am on it tonight!’) or the delicate place (showing that you are refined, you understand the beer; have conncected with it and want to treat it well so it rewards you with flavour). I like both ways, and both fill me with the last whisps of the satisfaction that come with handling a lovely new brown pint. As I passed over my card in The Queens Arms (30p charge… grrr), I allowed myself to drift through this process, my trance broken by the realisation that I would then have to write another sodding review.. 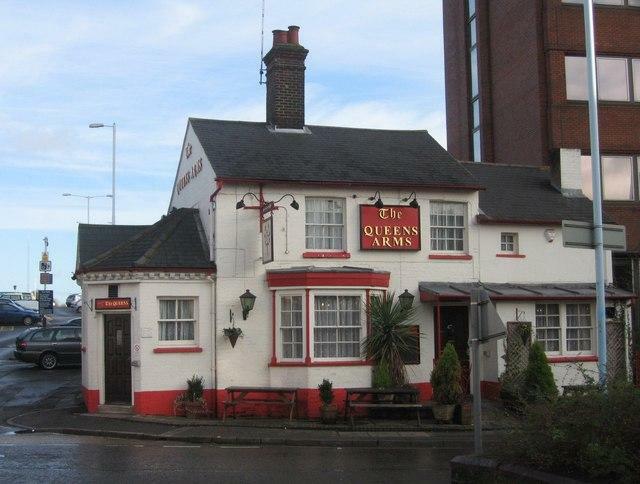 The Queens Arms isn’t a special pub. It’s got three guest ales, a good selection of bar snacks and food ( and they sell free range eggs behind the bar). There’s a solid quizzer (never out of service), a quiet little beer garden and loads of benches that get the sun long into the evening. It also happens to be right next to Basingstoke station, so it’s always filled with commuters (after work, not before! ), local tradesman and people passing through. The mix gives it the feel of a working pub, where folk go to have a pint before going home for tea. A pub where people tell stories of their days, discuss their problems, and laugh through life, and there’s something wholesome and satisfying about that too. I you’re ever delayed at Basingstoke for some reason I’d recommend jumping off the train for a quick pint here. Look out for me – I’ll be the chap with the crooked elbow making weird noises by the bar.